Stroke is an injury to the brain. It happens when the brain's blood source is stopped. Blood carries oxygen that all cells in the body need to live. The brain has one of the highest demands for oxygen. Cells in the brain die if they are without oxygen for more than a few minutes. This can cause lasting harm to the brain. Other terms for stroke are cerebrovascular accident (CVA) or brain attack. Blood vessels that carry blood from the heart to the body are called arteries. 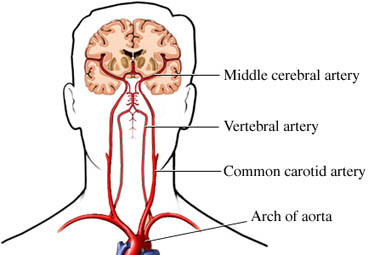 Oxygen-rich blood is brought to the brain through the carotid and vertebral arteries along both sides of the neck. These arteries split into smaller vessels that reach throughout the brain and skull. If they are harmed or blocked, it can slow or stop blood flow to the brain. The amount of harm depends on how much tissue was affected, how long blood flow was slowed or stopped, and the part of the brain it was in. Carotid artery stenosis —Narrowing of the carotid arteries that bring blood to the brain. It happens fromatherosclerosis. This is the buildup of plaque inside artery walls. Thrombus —A blood clot that forms in the arteries of the brain. It is often from atherosclerosis. Embolism —A blood clot that travels from some other part of the body. Often, the clot travels from the heart and gets trapped in the arteries that bring blood to the brain. It is often due toatrial fibrillation, a type of heart arrhythmia. Arterial spasm —Blood vessel walls can tighten or loosen to help blood flow. Problems with nerves, blood vessel structure, injuries, or stimulants can cause them to do this. This makes it hard for blood to flow. Spasms can cause problems on their own, but they may be more likely to cause blockages in blood vessels with atherosclerosis. Hypertension —Blood pressure is the force of blood on arteries walls. High blood pressure harms and weakens blood vessels. Brain aneurysm —An aneurysm is an outpouching of a blood vessel wall in the brain that forms in places where the artery wall is weak or thin. The bulging, blood-filled pocket can put pressure on parts of the brain. Aneurysms that burst can be deadly. Arteriovenous malformations (AVM)—A rare problem due to unusual links between arteries and veins. Instead of an artery bringing blood to the brain, it is linked to a vein that takes it away, going past the brain tissue that needs it. The blood vessels may get weaker over time. This may cause the vessels to widen or burst. A silent stroke happens without any of the usual signs or symptoms. They cause harm to brain tissue and raise the risk of a major stroke in the future. They tend to happen in silent parts of the brain that aren't clearly active for thinking or moving. Brain tissue harm is often found during imaging tests. Completed stroke—Reaches its greatest extent right away or over a few hours. 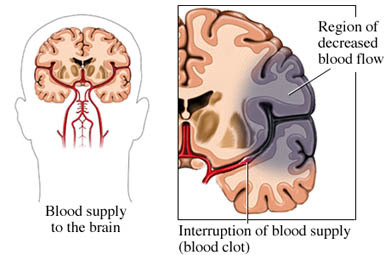 Transient ischemic attack (TIA)—A brief loss of blood supply to the brain that gets better on its own, within 24 hours. It is a warning that a more severe stroke is likely. Stroke in progress—One that gets worse over time, likely over days. Many small strokes may happen over time, from days to years. They can cause as much harm as one big stroke. What are the risk factors for stroke?What are the symptoms of stroke?How is stroke diagnosed?What are the treatments for stroke?Are there screening tests for stroke?How can I reduce my risk of stroke?What questions should I ask my doctor?What is it like to live with stroke?Where can I get more information about stroke? Impact of stroke (stroke statistics). American Stroke Association website. Available at: http://www.strokeassociation.org/STROKEORG/AboutStroke/Impact-of-Stroke-Stroke-statistics%5FUCM%5F310728%5FArticle.jsp. Updated June 6, 2016. Accessed January 9, 2019. Patient education: stroke prevention. EBSCO Nursing Reference Center website. Available at: https://www.ebscohost.com/nursing/products/nursing-reference-center. Updated June 29, 2018. Accessed January 9, 2019. Prabhakaran S, Ruff I, Berstein RA. Acute stroke intervention: a systematic review. JAMA. 2015;313(14):1451-62. Stroke. National Heart, Lung, and Blood Institute website. Available at: http://www.nhlbi.nih.gov/health/health-topics/topics/stroke/causes. Updated August 14, 2018. Accessed January 9, 2019. Stroke (acute management). EBSCO DynaMed Plus website. Available at: http://www.dynamed.com/topics/dmp~AN~T143427/Stroke-acute-management. Updated November 27, 2018. Accessed January 8, 2019. What is an arteriovenous malformation (AVM)? American Stroke Association website. Available at: http://www.strokeassociation.org/STROKEORG/AboutStroke/TypesofStroke/HemorrhagicBleeds/What-Is-an-Arteriovenous-Malformation-AVM%5FUCM%5F310099%5FArticle.jsp#.VnrryU2FPIU. Updated June 22, 2017. Accessed January 9, 2019.